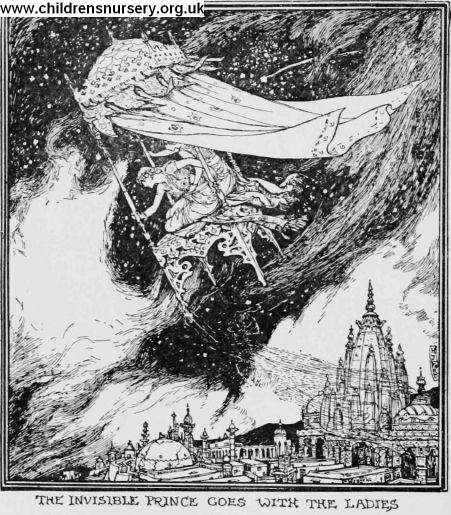 the rajah gave the signal to cease; and again the two women seated themselves on the stool, and, with the prince clinging to the leg, it flew back to earth, and bore Dorani and her husband safely to the scent-seller's shop. Here the prince hurried away by himself past Dorani's palanquin with its sleepy bearers, straight on to the palace ; and as he passed the threshold of his own rooms he became visible again. Then he lay down upon a couch and waited for Dorani's arrival.